YOU...Naturally Beautiful! 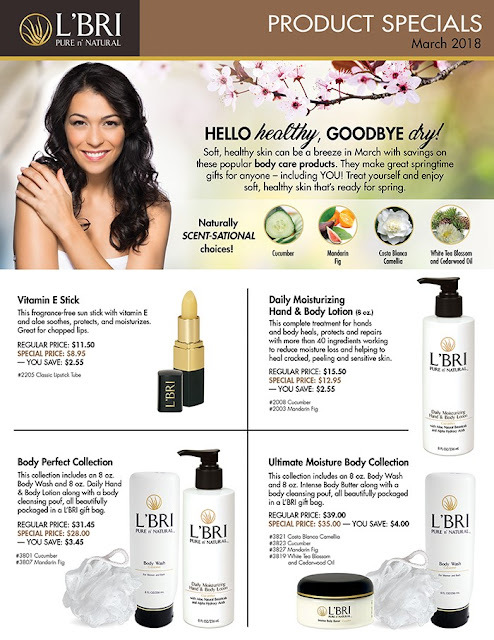 Great skin begins with L'BRI Pure n' Natural products. 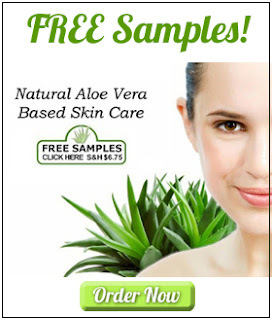 Fabulous aloe face and body care as well as cosmetics, health & nutrition and income opportunities. The winter has taken a toll on our skin. Repair and protect dry, damaged lips with this fragrance-free sun stick with SPF 22 Formulated with Aloe and Vitamin E to soothe, protect and moisturize the sensitive skin of the lips. Choose from two of our scents Cucumber, Mandarin Fig 8 oz. Nourish your body with our gentle body care collections, featuring aloe vera, botanicals and natural scents. Treat yourself to silky smooth skin. Gentle enough for the entire family! This collection includes an 8 oz. Daily Moisturizing Hand & Body Lotion and an 8 oz. Body Wash in Cucumber or Mandarin Fig scent along with a cleansing pouf, all beautifully packaged in a L'BRI gift bag. This pampering gift set features Body Wash and Intense Body Butter in Costa Blanca Camellia, Cucumber, Mandarin Fig or White Tea And Cedarwood plus a body cleansing pouf all beautifully presented in a L'BRI gift bag. When you join L’BRI in February, you can be one of the first to share our NEW baby products and get to know the most adorable customers! Choose the FULL Showcase in February for only $299 valued at more than $1,500 AND receive a Showcase bonus with all three of our NEW baby products valued at $53.85! You’ll also receive the black lace cosmetic bag that’s free with the purchase of a set beginning today! 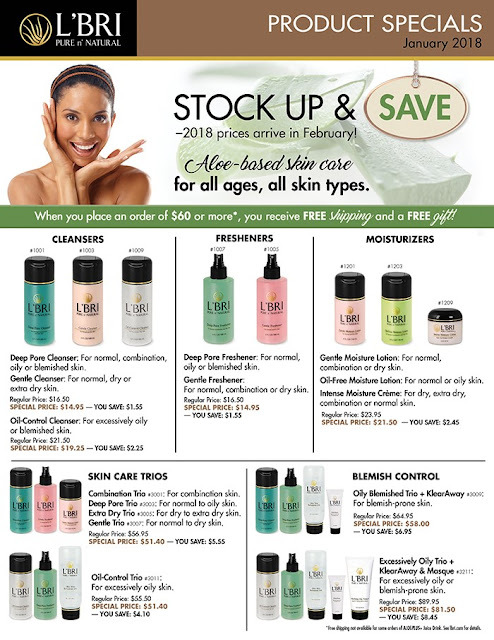 Or, choose the Skin Care Showcase that is only $99 in February and is an affordable way to join L’BRI and enjoy everything that life with L’BRI can bring! Are you ready to live the life of your dreams? Join L’BRI as an Independent Consultant and live the life of your dreams! It’s easy to start your own businesses with our Showcases, with full size products and samples to share, all the training materials you will need and a L’BRI website of your own. The most gentle body care products for the smallest members of your family. Our Baby Care includes Foaming Baby Wash, Baby Lotion and Diaper Cream! Baby Lotion - Naturally nourish your precious baby’s skin with the fresh blend of aloe vera, herbs and botanicals. Leave your little one’s skin feeling supremely soft and never greasy with this comforting lotion. Calm and soothe your baby with the light, refreshing scents of lavender and vanilla. Gentle enough to use for even the most delicate skin. Diaper Cream - Treat and prevent diaper rash with our natural diaper cream formulated with zinc oxide, aloe vera, shea butter and sunflower oil. Provides soothing relief from irritation caused by diaper rash, chafing or wetness that can irritate delicate skin. Foaming Baby Wash - Bath time will be a pleasure with this head to toe foaming baby wash, gently fragranced with the relaxing scents of lavender and vanilla. Contains aloe vera combined with soothing cucumber, chamomile, herbs and botanicals to cleanse and soften baby’s skin. Gentle enough to use every day and safe for the most delicate skin. Plus an unbelievable Go Dazzle offer! Buy a Go Dazzle Compact in February and you get a FREE Lip Gloss of your choice! Try our new makeup remover, it's on sale too! Start the New Year with amazing skin! All cleansers, fresheners and trios are on sale! To make gift-giving even easier, we are offering some of our very popular products at a very affordable price for our December Product Specials! Who wouldn't love our Aloe Jelly made from the best of the best aloe species? Hand Soap that's gentle and effective? Soothing and moisturizing Hand & Body Lotion, or our amazing Vitamin E Sticks with aloe? These specials are perfect gifts for all the helpers in our lives, from teachers to tellers, letter carriers and babysitters, mechanics or manicurists. Holiday Collection - something for everybody! 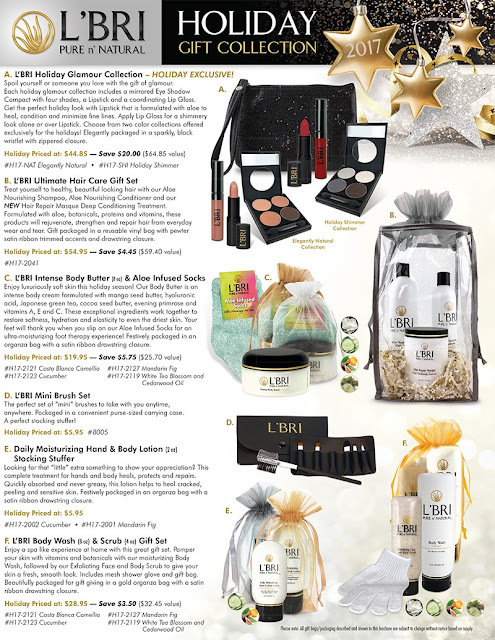 Shopping from the comfort of your home is a breeze when shopping for holiday gifts from the L'BRI Holiday Gift Collection! 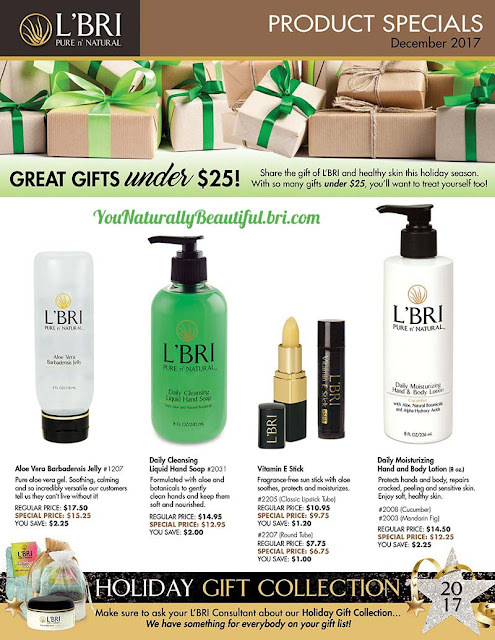 Give the gift of L'BRI this holiday season! this year's selections will pamper you from head to toe! *The Ultimate Hair Care Gift Set features one of our newest products, Hair Repair Masque. *The Body Wash and Scrub gift set is just the thing for soft, smooth skin. *Our specially featured Body Butter arrives with a pair of Aloe Infused Socks! *All orders of Body Butter and our 2 ounce Hand & Body Lotion will arrive with holiday wrapping! L'BRI Neck Firming Cream is available at a 50% savings for one week only! This amazing product is available for an incredible price of just $22. This offer ends at 11:59 p.m. Eastern Time on Wednesday, November 22, 2017. After just a few weeks of using L'BRI, I saw an amazing change in my complexion. My skin looks and feels amazing! What is the main ingredient in your current skin care? If it's water...that's exactly what you are paying for - water! L'BRI products are concentrated with high quality, natural ingredients, so they are GOOD for your skin and a little bit goes a long way! I would love to introduce you to these amazing products or if you already love L'BRI, I would love to help you!